Despite opposition from the media, Democrats and RINO Republicans, President Trump is moving forward with construction of the border wall. U.S. officials will begin easing environment laws for the border near San Diego. The U.S. Department of Homeland Security said on Tuesday it would waive environmental and related laws in order to expedite building security-related barriers and roads along the nation’s border with Mexico near San Diego. 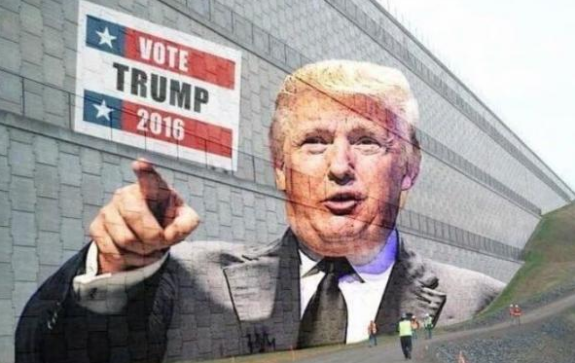 The projects would focus on about 15 miles (24 km) of the frontier extending eastward from the Pacific Ocean as part of President Donald Trump’s planned wall between the United States and Mexico, the DHS said in a statement. It said the area is one of the busiest U.S. border sections. “The sector remains an area of high illegal entry for which there is an immediate need to improve current infrastructure and construct additional border barriers and roads,” the DHS said. The department will oversee the installation of extra barriers, roads, lights, cameras and sensors on the border under the authority of the Illegal Immigration Reform and Immigrant Responsibility Act (IIRIRA) of 1996, the statement said. The act grants the secretary of homeland security authority to waive requirements to comply with various laws to ensure the building of barriers and roads, while being mindful of cultural and environmental impacts, the statement said. It’s no surprise the mainstream media has not yet figured out President Trump is a keen strategist with his eye always on the prize. And that prize, is the wall. A recent report shines light on the behind-the-scenes battle over border wall funding and how today’s banning of transgenders in the military all ties together. They turned to Trump, who didn’t hesitate. In the flash of a tweet, he announced that transgender troops would be banned altogether. Trump’s sudden decision was, in part, a last-ditch attempt to save a House proposal full of his campaign promises that was on the verge of defeat, numerous congressional and White House sources said. The president had always planned to scale back President Barack Obama-era policies welcoming such individuals in combat and greenlighting the military to pay for their medical treatment plans. But a behind-the-scenes GOP brawl threatening to tank a Pentagon funding increase and wall construction hastened Trump’s decision. Numerous House conservatives and defense hawks this week had threatened to derail their own legislation if it did not include a prohibition on Pentagon funding for gender reassignment surgeries, which they deem a waste of taxpayer money. But GOP leaders were caught in a pinch between those demands and moderate Republicans who felt the proposal was blatantly discriminatory. Recently, House Freedom Caucus chairman Mark Meadows revealed plans to force a government shutdown if border wall funding is not included in future federal spending budgets. In a phone interview on Monday morning, Meadows—the chairman of the most influential group of House conservatives in Congress, the House Freedom Caucus—said that there are enough members in Congress to hold the line against any funding bill that does not explicitly provide for the beginning of construction of President Trump’s border wall. What’s more, Meadows says, his conversations with President Trump indicate that the president is supportive of such efforts and would veto—or refuse to sign—any government funding bill that falls short of the commitments necessary to begin construction on the border wall. The current government funding bill runs out at the end of September, and there will be a government shutdown if the Congress does not pass—and President Trump does not sign into law—a new funding bill by the end of the fiscal year. Meadows told Breitbart News there are enough Republicans in Congress who will block any bill that does not fund the wall construction.